Pinarello, Jaguar and Team Sky marked the beginning of a new collaborative relationship with this year’s ‘game-changing’ launch of the Pinarello Dogma F8. The British engineering giants, Italian bike designers and world class professional road cycling team have combined their racing expertise, innovative design, technological engineering and manufacturing credentials to set a new global standard. 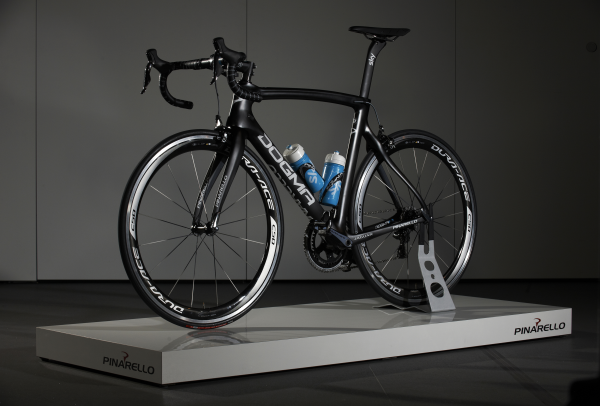 Pinarello and Jaguar have been Official Partners to Team Sky since 2010. Jaguar has provided high performance support vehicles to the team since their inception, including historic back-to-back victories on the Tour de France in 2012 & 2013. The F8 is the eighth generation of the award-winning Dogma range designed by Pinarello, who continue to work alongside Team Sky to help improve the bike each year. Following these ground breaking years, Jaguar announced a new deal to become an ‘Innovation Partner’ in 2014, which will see the car manufacturer work alongside Team Sky and its family of partners and suppliers, such as Pinarello, to integrate its extensive design and technology resources to further enhance the performance of the team. The design and development of the Pinarello Dogma F8 represents an engaging story that many in the ‘enlightened entrepreneur’ demographic can relate to. "This project collaboration included a world leading automotive brand, the world’s most innovative cycling team and the world’s best bike manufacturer to produce something that is stunning. A performance gain of above 6% in one year’s development is extremely impressive,” said Sir Dave Brailsford, Team Sky Team Principal. For a cyclist, emotion is the asphalt, the bends, the fast flats but above all it's the synergy of bike and rider. The Pinarello Dogma F8 is all this, the shape, the geometry, every line, every detail has been designed to excite and optimise performance. Cycling is a very competitive sport where every fraction of a second matters. The Dogma F8 is an award-winning showcase for innovation, seductiveness and performance. High performance, innovation and technologically advanced engineering is at the heart of Pinarello, Jaguar and Team Sky’s DNA. This collaboration provides a unique case study and insight into the world leading design resources at these companies. 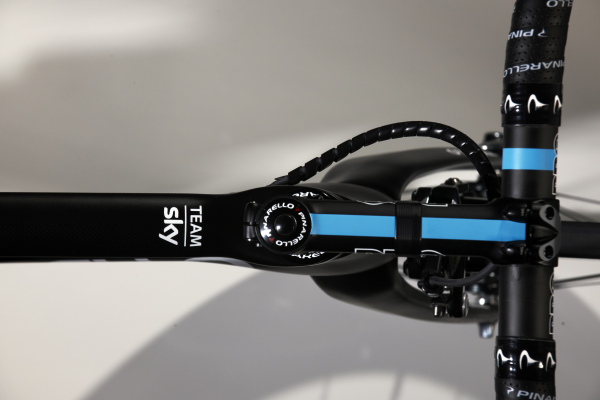 With the experience and knowledge of Jaguar’s performance engineers, combined with Pinarello’s world class reputation in frame building and Team Sky’s elite expertise, the Pinarello Dogma F8 is without question the fastest and most technologically advanced bike that Team Sky has ever used. Despite the innovations, Pinarello’s legendary design architecture wasn’t compromised. It was essential the bike looked, felt & performed like their award-winning bikes. The priorities included maintaining handling, reducing weight, and improving the stiffness and aerodynamics. Using Jaguar’s advanced computational fluid dynamics (CFD) capability and computational power, a high level of engineering and analysis were applied to a bike. Wind tunnel testing was used to verify the CFD tests. Both CFD and wind tunnel tests used a purpose built mannequin, to replicate a real rider’s shape and position. Results illustrated a 26.1% more aerodynamic performance than Team Sky’s previous bike, the Pinarello Dogma 65.1, and 6.4% more aerodynamic including a rider. The frame set alone is 40% more aerodynamically efficient. More than 300 CFD ‘virtual’ runs were done, using the same methods to optimise the aerodynamics of new Jaguar Land Rover road cars. The drag of every single component was measured, and single modifications could be analysed and compared. 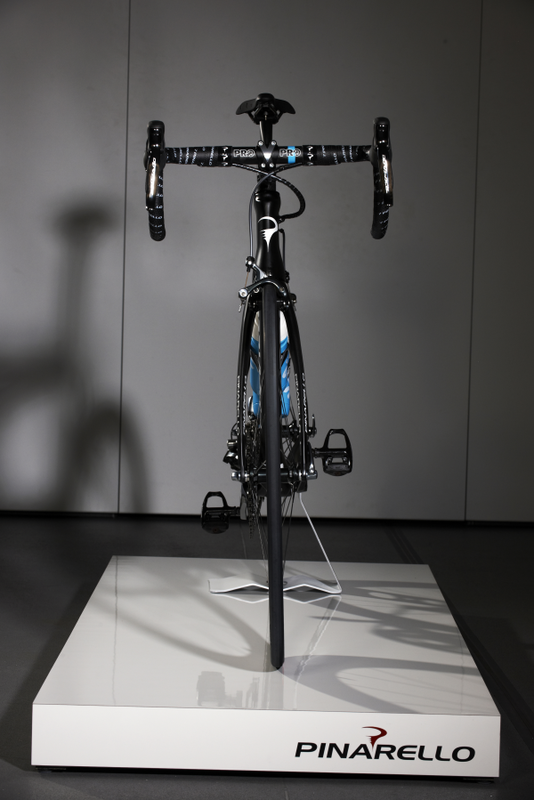 Working to fixed ‘hard points’ such as wheelbase and geometry determined by Pinarello’s designers, Jaguar’s engineers developed the frame to improve the aerodynamics of the tube profiles, and reduced the drag of components mounted to the frame. Pinarello pioneered their signature concept of distinctive asymmetric design on the Dogma range. In key areas, Jaguar enhanced this famous design e.g. the F8 seat mono stay around the rear brake is asymmetric to guide airflow cleanly around the brake calliper. Every element of the F8 was designed with high performance in mind. From the rear derailleur cable to the three holes on the seat tube, the F8 design and engineering makes it the most technologically advanced road bike in the world. Weight isn't a determining factor for judging a road bike - lightweight often means low stiffness and extreme fragility. A combination of the new tube profiles, asymmetry and new Torayca T11001K carbon fibre on the F8 increased the stiffness by 12% whilst the weight was reduced by over 9% (120g). The frame and fork represent 15% of the total aerodynamic impact of riding a bicycle - reducing this significantly increases performance. The greater the speed, the more relevant aerodynamic impact becomes. Wind resistance increases fatigue and hinders performance, so by minimising drag to practically zero to ensure seamless airflow onto the down tube, the Dogma F8’s performance in stronger winds is optimised and exploited by the riders. Jaguar, like Team Sky and Pinarello, are committed to increasing participation and interest in cycling at professional, amateur and everyday levels. Following Team Sky’s Tour de France wins in 2012 & 2013, more people in the UK are jumping on their bike, whether it’s riding to work or aspiring to be the next Chris Froome. Pinarello, Jaguar & Team Sky recognised an opportunity and utilised their shared expertise to bring the Dogma F8 to market, providing amateur cyclists the same access to world class design & engineering used by one of the world’s best professional road cycling teams.